Lyrical, languid and utterly beguiling, Chang-dong Lee's Burning demands that the viewer not only succumb to its wilful opacity, but revel in it. And that proves an easy task, given the exquisite filmmaking craft which ensures this slippery narrative captivates as much as it confounds. The first we see of delivery man Jong-su (Ah-in Yoo) is the cigarette smoke curling around the door of his van – a subtle visual marker for what is to come. Jong-su is painfully reserved; glimpses of family trauma – an absent mother, a father on trial for assault – may suggest why. 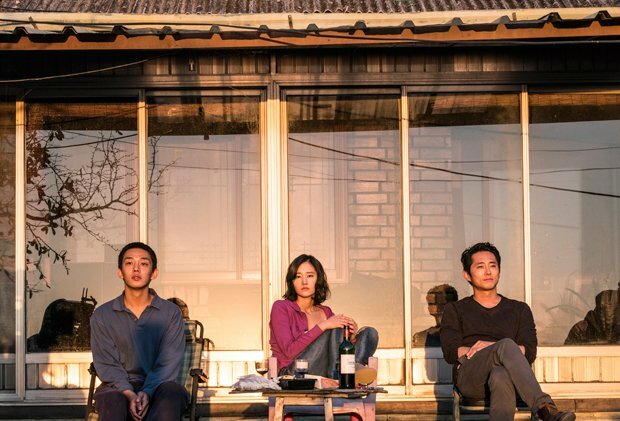 A chance meeting with Hae-mi (Jong-seo Jun), an old neighbour from his rural South Korean village, leads to an attraction that's quickly extinguished when she returns from a trip to Africa with the dashing, rich Ben (The Walking Dead's Steven Yeun). The three circle each other and, when Hae-mi suddenly disappears, Jong-su's suspicions begin to fester. Despite the incendiary promise of its title, there's not a lot of fire and brimstone in Burning, which is based on a short story by Haruki Murakami. It is instead a film of small turns, of miniscule moments that seem ordinary in isolation but, in rubbing up against each together, smoulder and then, eventually, ignite: North Korean propaganda messages drift across the border on the wind; a cat takes on prophetic significance; Ben's smile starts to turn sour. And, in an astonishing performance by Yoo, who allows his character's inner turmoil to radiate from behind his impassive expression, Jong-su's naive innocence begins to take on darker tones. Set against South Korea's rampant youth unemployment, with news snippets of Donald Trump playing in the background, there are hints of social alienation, of the widening class divide, of the limited options and increasing desperation of ordinary people like Jong-su. Yet any political commentary is secondary to the intimacy and immediacy of this story, which meanders from comedy to romance to thriller until it finally reaches its unforgettable climax. Fittingly, that final sequence, filmed in one of the film's many long, stunningly fluid takes by cinematographer Kyung-pyo Hong (Snowpiercer), offers more questions than answers. It's yet another beautiful frustration in a film that, despite its elusiveness, proves a vibrant, visceral experience. Selected release from Fri 1 Feb.
Jong-Su (Ah-in Yoo) is a delivery man with a troubled past, who’s attracted to neighbour Hae-mi (Jong-seo Jun) until she hooks up with dashing Ben (Yeun). Exquisitely crafted adaptation of a Haruki Murakami short story, meandering from comedy to romance to thriller before an unforgettable climax.